As we gather again to discuss the First procedure Roux-en-Y, I must advise that these are only my opinions and how I researched and made my decision for the procedure that I chose. This is one of the more popular procedures, In this procedure, a new gastric pouch is created at the bottom of your esophagus, using about five percent of your stomach and sealing off the rest. The pouch is then connected to your small intestine. Your stomach will still make important digestive juices that will mix in your intestine with food from your new, egg-sized stomach. In this way, you will still be able to receive the nutrients you need from food -- but your brain will get signals of fullness much faster, and the amount of food you can consume will become smaller. This procedure is also performed laparoscopically over 95 percent of the time. 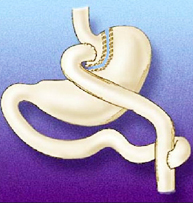 Here is a Gastric Bypass Video that will show you how the above procedure is performed. You can eat only a few ounces of food at a time. Your new stomach will only hold a tiny amount of food. You must eat very slowly and chew your food to mush, It was recommended to me that I chew each bite at least 15 times, yes count them. You will be surprised at how long it actually takes you to chew it up. And this is good. Even if you haven't had this surgery, this is a good rule of thumb. Otherwise, you may vomit often and have pain. You won't be able to drink for 30 minutes before you eat, during your meal, and for 30 minutes after you eat. I've mentioned this before and the importance of it. There won't be room in your stomach for both drinks and solid food. You probably will need to take vitamins and supplements. This is something that your doctor will advise you on. Everyone is different. When I first had this surgery I had to crush up my pills or split them so that I could actually swallow them. You may have to avoid foods that contain simple sugars-like candy, juices, ice cream, condiments, and soft drinks. Simple sugars may cause a problem called dumping syndrome. This happens because food moves too quickly through the stomach and intestines. It can cause shaking, sweating, dizziness rapid heart rate, and often severe diarrhea. It has been found during my research that most people who have had gastric bypass surgery quickly begin to lose weight and continue to lose weight for up to 12 months. One study noted that people lost about one-third of their excess weight (the weight above what is considered healthy) in 1 to 4 years. Some of the lost weight may be regained. I lost most of my weight within 9months and have maintained it. Until I became complacent, I then lost focus and have gained 30 lbs during the last year. But I have grabbed it and I'm down 12 lbs by getting ahold of it and getting back to the basics. I started the 5 day pouch test again, this has helped me tremendously and have began to exercise daily. It's so important to stay on top of things, Just because I got a little distracted isn't an excuse.... I have to hold myself accountable. My health depends on it. The laparoscopic approach showed similar results, with 69% to 82% of excess weight lost over 12 to 54 months. Their are risks common to all surgeries for weight loss include an infection in the incision, a leak from the stomach into the abdominal cavity or where the intestine is connected (resulting in an infection called peritonitis), and a blood clot in the lung (pulonary embolish). About one-third of all people having surgery for obesity develop gallstones or a nutritional deficiency condition such as anemia or osteoporosis. To prevent this my doctor suggested that I have lab work completed every 6 months, and take the calcium citrate to help with the osteoporosis. Fewer than 10 out of 1000 people die after weight-loss surgery. I really researched the statistics on this one. These are some of the risks that I found that "could" happen After a Roux-en-Y gastric bypass, once again, depends on each individual. The bypassed stomach may enlarge, resulting in hiccups and bloating. Hiccups have been a favorite of mine, especially when I don't chew my food good. I have also found that I have hiccups when eating fresh bread, mostly rolls from Logans. Needless to say, I stay away from them. If we go, I will "pinch" a piece off just for the taste, and I mean a pinch. Because if I eat a larger piece, it gets stuck, or in other words feels like I'm choking and it will not stay down. And I get to do a mystery shop on how clean their restrooms are. Gastric bypass surgery may increase your chances of living longer. Some studies show that people who have had weight-loss surgery have a smaller chance of dying of heart problems, diabetes or cancer. There is also a possibility that you may develop gallstones after gastric bypass. Sometimes the gallbladder is removed as part of the surgery. But if your gallbladder is not removed, then you may need to take medicine to prevent gallstones. I have found that with my gallbladder that if I eat broccoli and cauliflower that I have extreme difficulties. These are a couple of my most favorite veggies. I have tried eating them raw and steamed, either way they just do not like my new system. So when I eat them I have a pepcid tablet. Advantage of the laparoscopic approach to surgery for obesity suggest that it reduces recovery time and postsurgery complications. I hope that you will find some good information from this that will help you. I'll come back again and we'll discuss the next procedure Gastric Banding. Very informative article!! I enjoyed looking around and can’t wait to see your future posts! I’m a new follower Happy Friday!! I would love for you to stop and take a look at my blog as well! Thanks! Hi! I’m your newest follower. Please stop by and follow back when you have a chance. We also have a Friday Blog Hop going on too! Hope you are having a Sweet Week. I am your newest follower and glad to be! thanks for following me! That sounds painful, but any surgery is of course. New follower from BMBF. new follower and what an interesting post!! Very interesting with a lot of information. I enjoyed reading it. Love your springy background and header. I smile when I saw it. Hope your day is fun with a special surprise tucked in!